Maria Murnane: How one particular friendship helped Bridges come to life! Bridges is a story about how friendship can overcome differences such as geography, age, income, even marital status. In my own life, friendship helped me overcome the fear that my success as an author had come to an end. I make a living off my novels, so after I finished Wait for the Rain, which I absolutely loved writing, I put a lot of pressure on myself to begin another book right away. That proved to be a terrible decision because I didn’t have a good idea for an interesting plot. As a result, I ended up spending more than a year working on––forcing, actually––a lackluster story that was going nowhere. In the process, I not only lost my joy for writing but my confidence. When I finally decided to pull the plug on the book, I honestly didn’t know if I had it in me to write another one. Fast-forward a few months, and during a visit to see my parents back to California I met up with my dear friend Annie Flaig, who may be the most kind-hearted person I have ever met. A devoted fan of my books—as well as the inspiration for the globe-trotting, ultra successful saleswoman Skylar character in both Wait for the Rain and Bridges—Annie convinced me to get back on the horse, and over dinner, we put our heads together and came up with the idea for Bridges. It was a bare bones outline, but it got me motivated to try again. As soon I returned to Brooklyn, I sat down and started writing. For months I wrote and wrote, and when I finished the first draft I emailed it to Annie to see what she thought. My book made Annie cry, and Annie’s reaction to it made me cry. How wonderful is that? 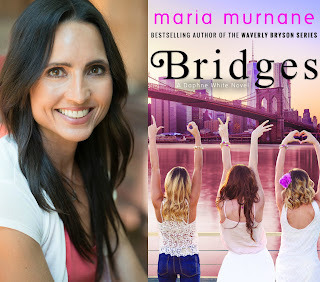 I never would have been able to write Bridges without her help and support, and I can only hope those who read it enjoy it a fraction as much as she did. Here’s to the power of female friendship! Maria Murnane spent several years working in high-tech PR before deciding she needed a change. She quit her job and went to Argentina by herself for what was supposed to be a two-week trip before figuring out what to do next. Instead, she ended up staying for a year to play semi-professional soccer, and while down there she also decided to write a humorous novel called Perfect on Paper based on her experiences as a single woman in San Francisco. Fast forward a few years, and she’s now the best-selling author of the Waverly Bryson series (Perfect on Paper, It's a Waverly Life, Honey on Your Mind, Chocolate for Two), as well as Cassidy Lane, Katwalk, Wait for the Rain, and Bridges. Visit Maria on Facebook, Twitter, and website. Sometime creative rest is the best thing to nurture the muse -- that and a spark from a friend! Wonderful story. Will circle back to check out Bridges when A to Z is over! I love to read of the experiences of real writers, something we amateur bloggers can only aspire to I've just been reading the 5* comments on Bridges at Amazon. Awesome. If only! What a great, heartfelt response from Annie! Thanks for the backstory on Maria Murnane. Thanks for the backstory. I will be reviewing your book on this blog next month. Really looking forward to reading it.